Looking for something sweet and gooey? Well, look no further than these Chocolate Caramel Bars. They are oozing with gooey and sweet sweet sweet. Start with melting down some creamy vanilla caramels. (Try not to eat them all.) Make an oat-based crust and, while it prebakes, stir your caramel mixture until it is a smooth golden liquid. It may take a few attempts to melt the caramels in the microwave but it eventually works. Pour chips or chopped chocolate on the base and then pour the caramel sauce. Finally, top with the oat mixture and bake for 20 minutes. If I were going to make these again, I would line my pan with foil or parchment for easy removal. These bars were sticky! Also, try to let them cool completely so they firm up and cut nicely. Popping them in the fridge after they've cooled is not a bad idea. Overall I liked them enough. They taste much better chilled and firm. If you like your caramel soft and warm, ice cream would be an excellent accompaniment to this toothsome bar. As I sit here, snow is falling outside my window. The weather has not changed a bit since last week. To warm myself up, I combined two things I love and made one scrumptious cookie. 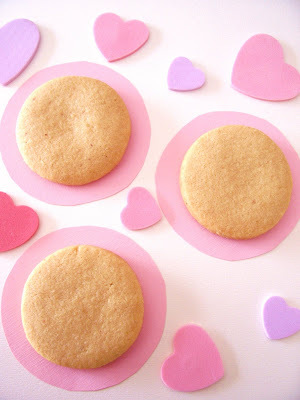 Peanut Butter Shortbread Rounds are the ultimate shortbread cookie. They are soft, tender and melt-in-your-mouth heaven. Really, you don't have to chew if you don't want to. When you touch the cookies, you can feel the butter. By baking them at a lower temperature, they bake for longer and do not brown like regular cookies. Using natural peanut butter for this recipe is best since you get unadulterated peanutty flavour but I suppose you could use regular PB but I can't vouch for how they'll taste. These gems are not time consuming to pull together so just give yourself time for rolling, chilling and baking and you'll be fine. They may look unassuming but they have lots of flavour. If you want to make them more interesting, roll the cookies thinner (1/8 inch) and sandwich them together with jam or melted chocolate. If you do that, then why not drizzle some chocolate over top? They would look fabulous and be even more perfect for sharing with the ones you love. I've seen enough snow this winter. We just got through another huge snowfall and the snowbanks are as tall as me. I like winter because I know Spring is around the corner but I don't like shoveling rock hard ice off the driveway. If you find yourself in a similar predicament, I suggest baking with tropical ingredients to make it seem warmer than it really is. I've wanted to make these Coconut Custard Squares for a while and finally bought a new 9-inch pan for the occasion. 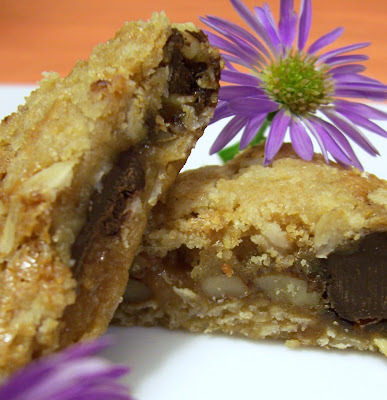 The bar is a layering of sweet pastry crust, coconut filling and cashews for the topping. No special skills are involved for the crust. You just pat it into the pan. The filling is also quite easy to whip up. Just remember to pour it evenly otherwise you'll have some squares that are more custardy than others. The cashews add a nice touch but do not necessarily add any crunch. 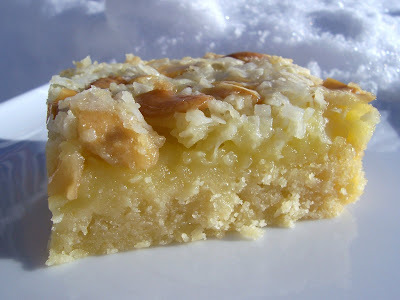 The squares are quite nice and the custard is very subtle in it coconutness. It is surely creamy and pleasing to eat. The crust is not overwhelmingly sweet and the bars cut very cleanly. They taste much better the next day after they have been thoroughly chilled. The cupcake craze has come to Milton! Years ago, you could first see the trend emerging in New York at Magnolia Bakery. They created these colourful sugary confections to the delight of customers and tourists alike. Since then, the cupcake has never looked back. It gained popularity because it appealed to those desiring a single-serving dessert, are easy to eat and come in all different types of flavours. Now the cupcake has come to my backyard. First of all, I can definitely say that children will love these cupcakes. I barely had enough time to take some pictures before they were ravaged upon by my family. I chose a Marisol cupcake for myself and throughly enjoyed the half that I ate. The icing was ultra light, smooth and velvety. It was buttercream at its best. The cake was moist and fluffy creating a overall tasty cupcake. So if you're ever in Old Milton, do check them out. They also sell cakes and other baked goods that are listed on their website www.flourgirls.com.